This is apparently going to be a very patchwork-y year! I’m super excited to introduce a new series I’m working on with Amanda called ‘Patchwork Palettes’. Amanda and I have been hanging out on the ‘internets’ and chatting about all kinds of fun, crafty ideas over the last little while. Since Amanda is in California and I’m here in Toronto, we starting discussing a project we could work on together, long distance. 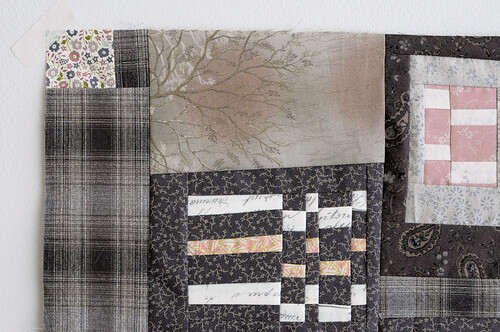 We both absolutely love patchwork, colour, and Pinterest (surprise!). So, we decided to take turns choosing an image that we would draw colour inspiration from and each create a patchwork block based on that image. The only rule for the project is that the finished block needs to be 15″ square or less. For our first block, we used an image that Amanda chose that was originally posted on Design*Sponge’s Amsterdam Architecture post. It’s a lovely image of some buildings in Amsterdam along the canal. I love that the middle building is pink! I had a lot of fun choosing fabrics for this block. I was inspired by the contrast colours of the windows in this image and you can see how that reflected in my final design. I made my block without a plan and improv pieced the whole thing. It got kinda tricky when I had to try to figure out how to make my smaller components fit together, but in the end was able to pull it all together using a Japanese woven plaid fabric. You can check out Amanda’s block here. In classic Amanda fashion, she did an incredible star called “Rhode Island Star”. I love how perfectly precise hers is compared to my wonky block. It’s amazing how wonderfully different our interpretation of colour translated into these blocks. I wonder if some of Amanda’s precise piecing will rub off on me during this series? I hope so!! I’m pretty jazzed to continue with this joint project. I have already chosen the image for our next installment. We’ll be joint posting our next blocks at the beginning of February. Yay! I admired this on the table on Saturday–it’s lovely, as is the picture it was inspired by. 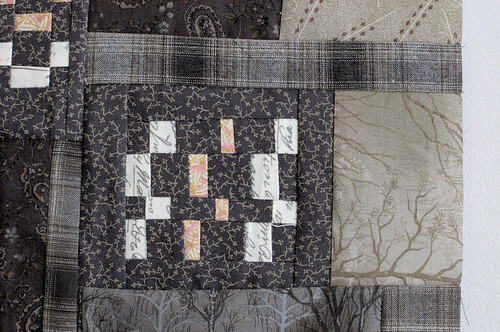 I have to tell you, over the last few weeks I have so inspired by your sunday quilt blocks! 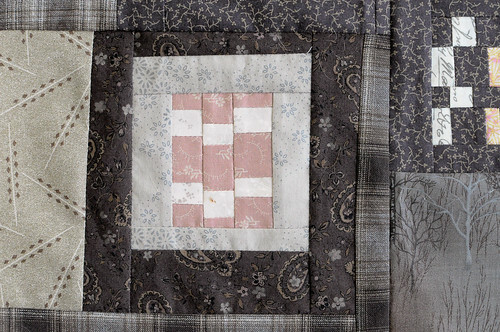 I think you have single-handedly renewed my interest in quilting. 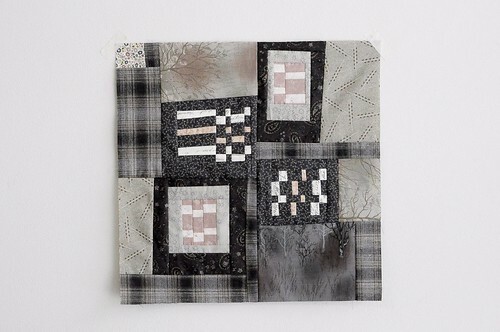 I’m definitely going to be trying out some free form patchwork soon! WHEN are you going to do a workshop on how you do _this_. And by _this_ I mean, picking and choosing colours, textures and patterns. And then putting them together organically, like you didn’t think about it in a atypical, modern way. We need a ‘craft salon’ (cralon? salft? talon?) where everyone brings scraps and you guide us in the ways of that voodoo you do? Please?! Completely, totally amazing. I can see I’m gonna love this series! you are so incredibly inspiring, this project is getting me SO EXCITED!!! Lovely! I can’t help but I noticed some Yoko Saito gorgeous prints in the block.